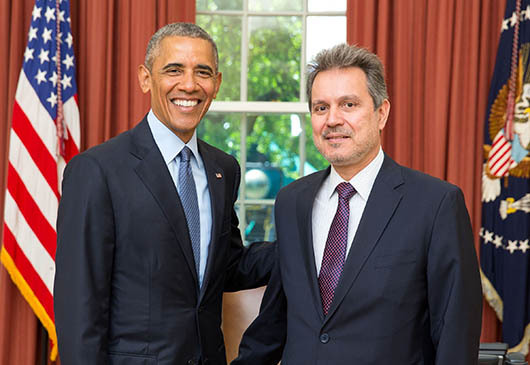 GREECE STEPS UP US SPIN CAMPAIGN – Alternate Comms. GREECE THROWS IN “BORROWED GERMAN CASH” AT US SPIN CAMPAIGN! 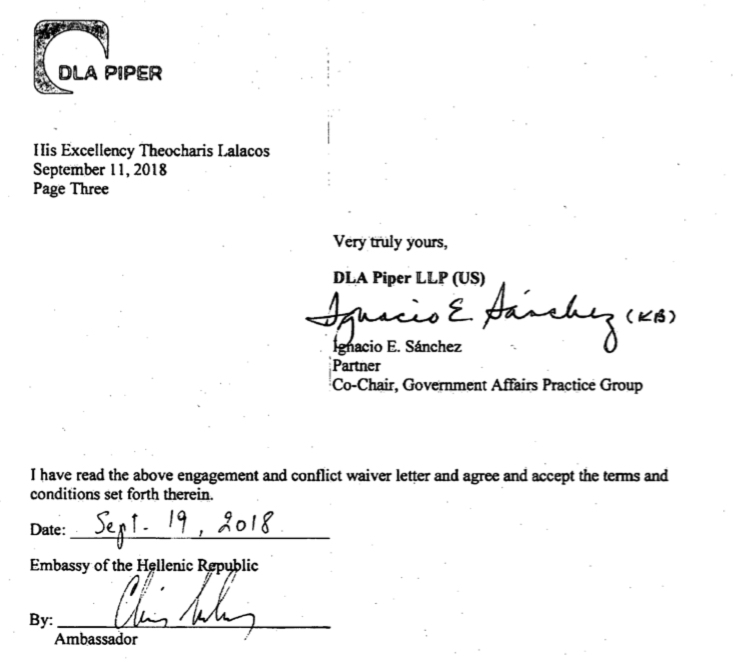 Greece’s Ambassador to the US, Mr Theocharis Lalacos, formerly Greek Ambassador to Macedonia, signed in September a million dollar deal with a leading US lobby firm to push Greece’s national agenda in Washington, according to US Justice Department documents. Cash-strapped” Greece turning up the Diplomatic Hellenic Heat ! 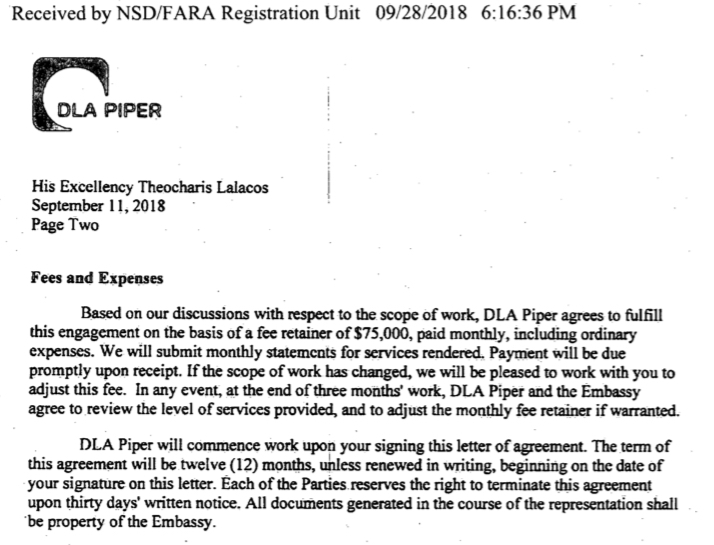 September 2018 – Greek Embassy in Washington DC hires US lobby firm DLA Piper at $75,000 USD per month retainer to lobby US government over Greece’s national interests. 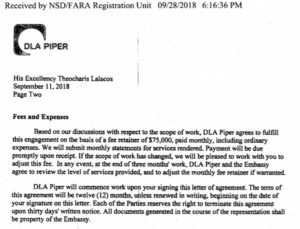 That’s $900,000 USD -close to a million dollars in official influence peddling. “It seems like Athens will spare no amount of borrowed German Euros in pursuit of age old strategic goals, including the cultural genocide of Aegean Macedonians [ethnic Macedonians in Greece]. 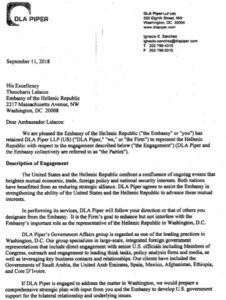 The US Justice Department’s FARA (Foreign Agents Registration Act) website lists no active US lobbyists engaged by the Republic of Macedonia. Greece and Bulgaria deny the existence of a Macedonian identity and has blocked the Republic of Macedonia from joining the European Union and NATO. 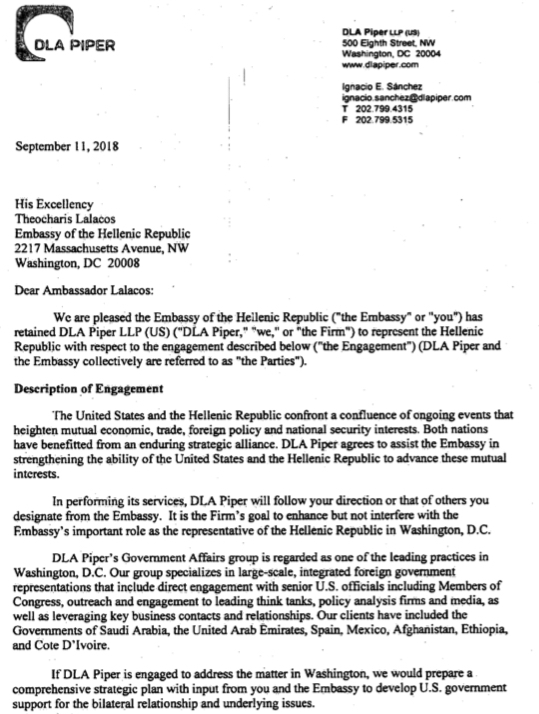 A pro US government was installed in Macedonia in early 2017 led by Prime Minister Zoran Zaev who has signed a number of controversial agreements with neighbouring Bulgaria and Greece which aims to erase Macedonian identity in order to satisfy Bulgarian and Greek demands; both staunch allies of the US. In 1912 after nearly five centuries of Ottoman Turkish occupation, Macedonia was partitioned among Greece, Bulgaria and Serbia. All three pursued a brutal colonial campaign of assimilating Macedonians by force. The part of Macedonia under Serbian colonial rule became after World War II a republic within Tito’s Federal Communist Yugoslavia. In 1991 it declared independence from Yugoslavia and Greece from day one has blocked its entry into the EU and NATO. 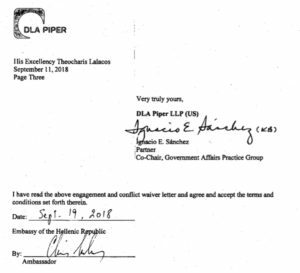 Macedonia signed the controversial Prespa Agreement earlier this year with Greece which will see Macedonia change its name to North Macedonia and remove “Macedonian” as a specific nationality or ethnicity. This has angered many Macedonians who boycotted in large numbers a referendum held on 30 September this year to accept the Agreement. On 19 October under murky circumstances the government managed to secure two-thirds majority in a parliamentary vote to “open up” the Macedonian constitution to make the necessary changes to satisfy Greek demands made in the Prespa Agreement.